Ah, I knew better. I didn't fall asleep until after 0330. Woke up at 08 in time to take my morning med. No wine tonight. It has been Spring-storm kind of light rain where you can still work outside. Did a lot of weed-pulling and mowed about 1/2 of the lawn but had to stop due to wet grass. I'll make Easter eggs tonight and get Spidey to help. He and his dad did move a large pile of clippings from the yard and took them to the ranch. Easter breakfast at church at 8:30 a.m. tomorrow and then we'll have Easter dinner at the ranch about 4:00 p.m. I came back into the house and someone had started a fire in the woodstove. I'll tell ya coming in from fresh cool-ish air after working most of the day outside to a warm house . . . makes a person sleepy. That's all folks . . . have a good evening. 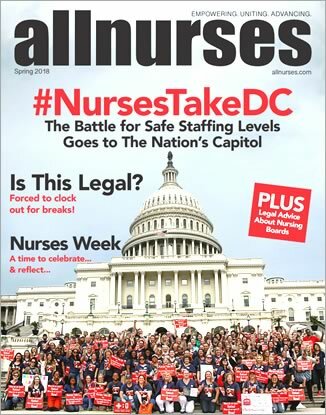 Nurses are heros. That means you too. Unless of course we spend our time playing cards. I'll probably regret it but a glass of wine sounds nice. I'm hoping Mr. Insomnia Monster doesn't visit me tonight. My condolences to you and your family herring. I am glad she got to go the way she wanted to go. No insomnia for a few nights. Did 3 miles on our rolling country roads. Funny, that just reminded me that a lovely and at times ribald 91 year old pioneer here died and the memorial was just so amazingly fun. Lots of great stories, especially from her grandchildren. There was a local band there and the last song was "Take Me Home, Country Road" and they encouraged us all to sing along. Didn't take much encouragment. I made crock pot chili while talking to my daughter in Portland. Love the speaker option on cell phones. That's about it. Still zero census. Good morning - that photo of all the pollen is amazing. It is technically my day off but we are still at zero census and I need some hours so I'll probably go catch up on the education videos my place of work mandates. Spidey (Danny) has two make-up baseball games with Mt. Shasta today. It should be a nice day, unlike the rain last week that canceled the games. His grandma loves the games and so we will try to make sure she can attend. Her appt with the neuro is on Monday and I'm sure my diagnosis is correct but we shall see. Her goal is more energy and less tremors. She's 90 and has always been a busy woman. And it is Spring and her garden/yard needs her . . . Amazingly, I slept last night. After a 2 hour nap. Funny, a link from MD Anderson (where my eldest had his stem cell transplant) came up with "10 symptoms you shouldn't ignore" related to cancer. Extreme fatigue was on the list. Yikes. I'll try to get a hike in at the local water fall too . . . we shall see. Have a great day everyone. He came to my house . . . I finally resorted to Mr. Ambien. We've got vivid green grass and blooming daffodils and fruit trees are full of blooms as well. Oh and good morning to you all. Should be in the high 70's today with no clouds. Spidey's pickup broke down last week but it was easily fixed and he's a happy kid. Tonight is Open House and the junior parents are meeting with the school staff to plan senior year stuff at 6:00 p.m. Indian tacos at 5:00 p.m. and then Open House for all at 7 p.m. I had a class scheduled for making plant terreriums . . . but it is at 6 p.m. as well. Enjoy your day; hope it brings good things. Hi all - headed to bed and hopefully to sleep. Stay away from me insomnia monster, if you please. Challenging day in sort of the same fashion as Nel. Honesty is the best policy but I found a saying online that sorta sums up my thoughts tonight. Everyone appreciates your honesty. Until you are honest with them. Then they think you an . . . Yup. Safe travels and a good night's sleep to you Tweety. I guess it is polically incorrect to say who speaks in the 12 minute video but there are a myriad of different people. I saw this a few months ago and remembered it tonight. "It was harder to come out as conservative . . . "
Hi everyone. Wow, that Eggs Carmel sounds wonderful! Hi Tweety - glad you check in. Sorry about the insomnia BC. I'm in a good sleep cycle right now . . . but I know that insomnia monster is lurking. Maybe with my kicked up exercise that will keep the monster at bay. We shall see. I spent the morning with my son. We picked up his Nana's non-burnable garbage along with ours and recycling (plastic bottles/aluminum cans) and took them to the dump/disposal area. Took ourselves out to lunch at Subway with the proceeds ($26.00). Son dropped me off at home and he went to pick up a friend for hitting practice at the high school. Today is Opening Day of Little League Baseball. I'll probably head over to watch my nephew's kids play. It is sunny and in the 60's. I'll most likely mow the lawn when I get back. Maybe burn the yard waste from all the pruning I've been doing. Take care everyone. Oh, I would fit right in there. Love seafood. I loved the food in Vietnam. So glad I got to go twice. Wish I could go again. End of a good day. Went to a celebration of Country Doc of the Year for a local physician. It was really good. Lots of stories and he shared a lot as well. Great turn out. I worked with him before I became a nurse and he taught me so much. Spidey is home - they won both baseball games and he did very well pitching. I'm headed to bed. You all have a good night's sleep. I don't. At all. He's wrong. From my zip code. I know . . . I don't get it. It hasn't happened lately . . . but I do love it when people think I'm younger than I really am. Especially when I'm the mom of a 17 year old boy who is a junior in high school and I'm 61! You do the math. My older kids are 36, 34, and almost 30. Good evening from the very rainy mountains. It is simply pouring down. Both baseball games were canceled after 1st one was stopped for rain in the 4th innning and the rain never stopped. I just heard loud and long sounds of thunder!! Yikes. Hope we don't lose power. Tweety - thinking of you. Safe flight and great food and fun! My day has been kind of crappy in a few ways so I'll just sign out and be grateful for leftovers. I'm not in the mood to cook. Hope everyone's evening is all you wish it to be. Take care!